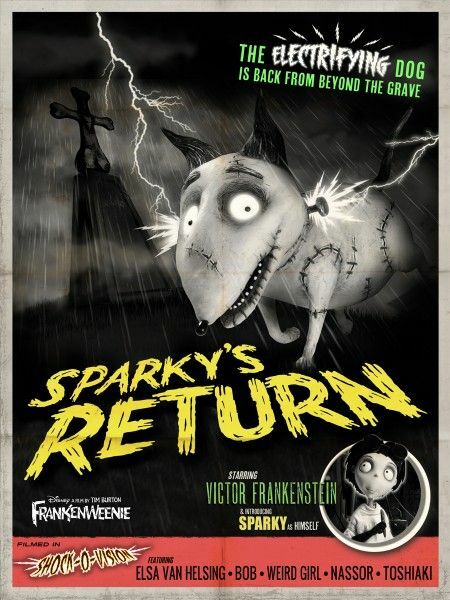 Frankenweenie, from director Tim Burton and screenwriter John August, is a charming, macabre and heartwarming tale, about Victor (voiced by Charlie Tahan), a young boy who, after unexpectedly losing his beloved dog Sparky, harnesses the power of science to bring his best friend back to life, but quickly faces unintended and sometimes monstrous consequences for his actions. The voice cast also includes Catherine O’Hara, Martin Short, Martin Landau, Winona Ryder and Atticus Shaffer. During this recent exclusive interview with Collider, John August talked about how his collaboration with Tim Burton originally started, expanding the original Frankenweenie short into a full-length feature, how amazing Weird Girl and her cat are, and his reaction to seeing the finished product put together. He also talked about the challenge of actually getting a script made into a film, how many unproduced scripts he has sitting around collecting dust, what made Big Fish right for a Broadway musical, how he came to be collaborating with Josh Friedman (The Sarah Connor Chronicles) on a potential TV show called Chosen, that he plans to direct again after Big Fish makes it to the stage, the status of Preacher, and more. Check out what he had to say after the jump. Collider: What initially brought you and Tim Burton together as collaborators, and what is it about your collaboration that works so well? JOHN AUGUST: Big Fish was the first movie that we worked on together, and I had already written it. We had another director, but that director didn’t do it. So, it was just a Hail Mary to Tim, and Tim said that he wanted to do it and I was like, “That’s fantastic!” But, there wasn’t a lot of collaboration because he knew what he wanted to do and just did it. There were very minor changes for Big Fish. For Charlie and the Chocolate Factory, he came to me and said, “I want to do everything that’s in the book, and as much more as you need, so that it all makes sense.” I was like, “Okay!” And then, I would pitch back to him my love for Charlie Bucket’s family and how lucky Charlie was, and that I felt so bad for Willy Wonka, shut up in his factory, all alone with these crazy Oompa Loompas. He was like, “Okay, do that!” It works well because it’s mostly about recognizing what I need to give to Tim, so that he can make his best movie. I have to recognize the things that are going to be fascinating to him, scene by scene and page by page, so that he can have the movie he’s decided to make. Were there any extra pressures on this, knowing that this was such a longtime passion project for him? AUGUST: I knew that this was the movie in which a lot of the cinema version of Burton-esque first started. So, I knew that there were things that were hugely important to him for it, but it didn’t really feel that different than working on any other of these projects. You’re looking, moment by moment and scene by scene, how you can tell the most interesting story. So, we had this great short and we knew that we had a story about a boy and his dog. Because we had that pure emotional core, we could go on crazy tangents and always come back to Victor and Sparky. When I wrote in stuff like Weird Girl and the cat poop, Dutch Day and the windmill, it felt like it was part of Tim’s universe. Did you have any idea that Weird Girl was going to become such an audience favorite? AUGUST: I knew that Weird Girl was going to be kind of amazing. The secret truth of Weird Girl is that I put her in there originally because I needed some way to set the boys’ names. One of those strange things that happens in movies is that you need someone to actually say people’s names, or else you have no idea who those kids are. This was a way for her to introduce who the important boys were in the story, but then it just was so funny that it became a centerpiece to it. When you look at the character design that Tim did for Weird Girl, and what Catherine [O’Hara] did with the voice, and it’s gonna kill. When did you get to see what Weird Girl would look like? AUGUST: When Tim asked me to do Frankenweenie, he had his original sketches from before he did the short, of what Sparky looked like, and he drew Victor and some of the other crucial people. The remarkable thing about working with Tim is that, once he’s read a script, he sketches out everybody else. You know something has really stuck in Tim’s head when he’s drawn what the character looks like. Weird Girl and Elsa actually switched places, at one point. 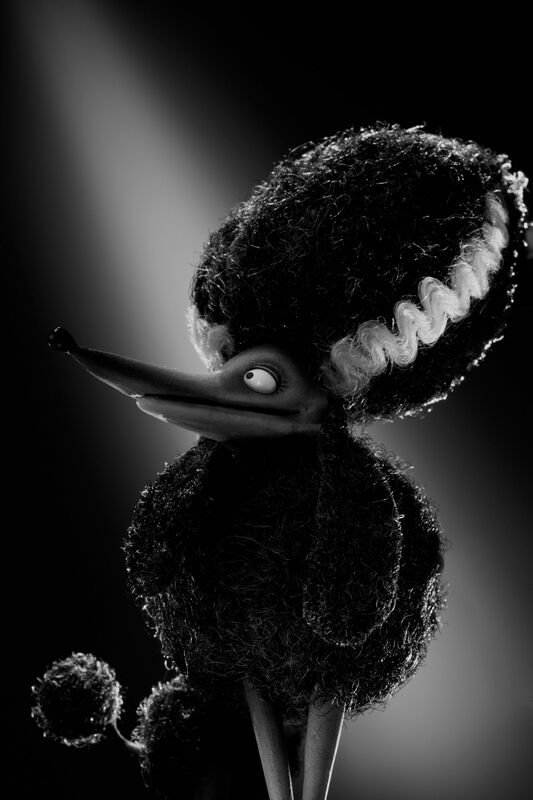 I may be mis-remembering it, but the original design for Weird Girl was actually Elsa, but then it became Winona Ryder’s character, and the new Weird Girl was just fantastic with those giant wide eyes. Keeping the cat front-and-center was definitely a smart choice, from Tim and the animation department. Mr. Whiskers got referred to more than we actually saw him on stage. Seeing him on screen, you just love him. What was your reaction, when you saw the entire thing put together for the finished product? 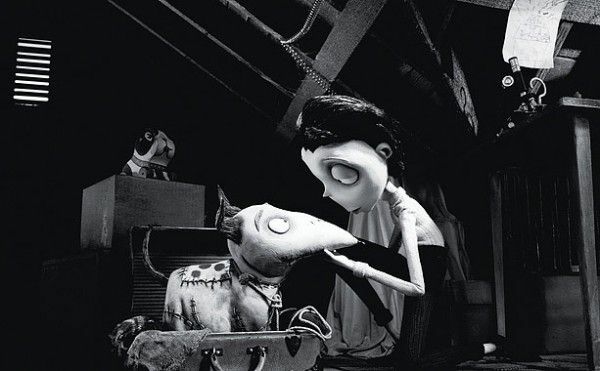 AUGUST: With Corpse Bride, I saw a lot more of it during the process because we were changing things a lot. When I came onto Corpse Bride, it wasn’t a musical. I convinced Tim to add one song, and then we added five. We changed a lot of things while we were shooting, which you should never do in stop-motion animation. With this, it was a much smoother ship, so I wasn’t getting sent the scratch reels of things. Every once in awhile, Allison Abbate would drop a note and say, “It’s going really well!,” and I was like, “Great!” So, I had not seen it in about two years. They went off and started shooting, and I saw it all put together with almost the final sound mix and it was remarkable. I was so, so happy and relieved, not in the sense that I thought something had gone wrong, but you just don’t know what something is going to be like until you see it put together. Everyone stepped up and brought their A+ game. As a writer, especially for feature films, you never know if anything you write will get made, or if it does get made, whether it will even resemble what you’ve written. Does that make working with Tim Burton a luxury, in that regard, since you know your work will make it to the big screen? AUGUST: Yeah. I often say that a lot of my job, as a screenwriter, is sort of being a stock picker, in that I need to figure out what movies are probably going to get made because otherwise I’m spending a lot of my time on something that’s trapped in 12-point courier. So, having Tim’s interest in doing a movie is a huge asset. But, not everything shoots. I’m always grateful when those things do happen. How many scripts would you say you’ve written, that are just sitting around collecting dust? AUGUST: I counted it up once. I think I have written 45 full screenplays. Of those, maybe 15 have been shot, in some form. That’s a pretty good track record, but it’s not 100%. It is frustrating that, as a screenwriter, I’ve seen all those movies and they don’t exist in the real world. They’re juts inside my head and on those pages. How frustrating is it to work on something like Preacher, which has now been through a handful of directors and still isn’t moving forward yet, and yet everyone still asks you about it? AUGUST: Preacher is a great frustration because I thought it was done, and then it got put in the press notes for the [Frankenweenie] junket and everyone started asking about it again. Preacher could be filmed, at any point. It’s sort of ready to go, but it’s lacking a green light. At some point, that green light might come, but it may never come. So, I have to allow for the fact that I’ve done everything I can, and whatever happens with it, happens with it. What is it about Big Fish that makes it enduring enough to do a Broadway musical for it? Was that something you ever could have imagined would happen? AUGUST: The producers and I first talked about the Big Fish musical, right before we did the first test screening of the movie. I said, “I think there’s a Broadway musical here.” And really, from that day, we started figuring out how we would do it. Like Frankenweenie is a story about a boy and his dog, Big Fish is the story of a father and his son, and all those conversations you can’t have. It’s universal, in a way that can go from one medium to another medium. That’s been the funnest, figuring out what we can do in a Broadway show that’s unique and special. Have you always found yourself writing such personal little stories that are also so universal? AUGUST: I’ve always written towards movies that take place across two worlds. Most of the movies that I’ve worked on take place in two worlds, or sometimes three worlds, where you have a normal world and a fantasy world that mix and overlap. I never shy away from the series stuff in the real world. Big Fish is about mortality. 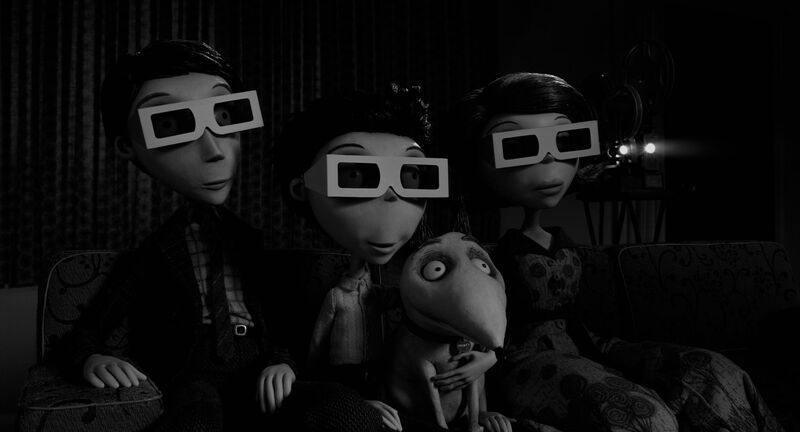 Frankenweenie is also about mortality, but at a very different stage. It’s losing a parent versus losing a dog. I don’t run away from the tears of that, which I think is what makes it feel universal. How did you come to be collaborating with Josh Friedman on a TV show, with Chosen? AUGUST: Josh and I have been friends for years, and he said, “Hey, if you ever want to do a TV show, I can take it over and run it,” and I was like, “Yes!” He’s always been so busy that I never dared to ask that, but it just worked out, time wise, that this was the season where we could probably do it, so I jumped at it. So, even though I’m busy with other stuff, I’m excited to be writing this. What can you say about the story? AUGUST: I loved The Sarah Connor Chronicles that Josh did, and I loved that it was a family drama with a huge, different element. And this is also a family drama with a huge, very different element. I think he’ll kill it. It will be great. Do you want to direct again, at some point? AUGUST: I do. So, after we get Big Fish up on stage, I’ll go back and write a movie for myself to direct. You also seem to like to advise other screenwriters, through your website, on Twitter your apps and with the Sundance Screenwriters Lab. What motivates you to do all of that? AUGUST: I just always remember myself as the teenager with questions about movies and screenwriting. I would hope that there was somebody out there who would answer those questions, and so, if I can take a few minutes to do it, I will. It’s not threatening for us. We’re not being stalked, so it’s easier. 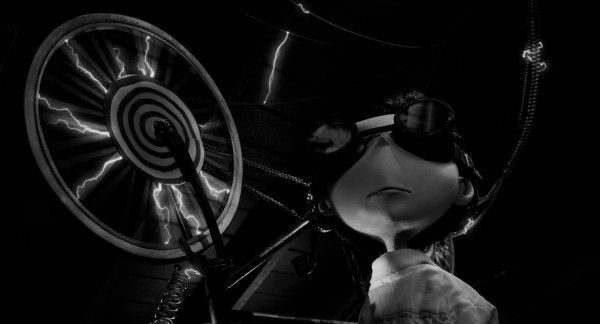 Frankenweenie opens in theaters on October 5th.